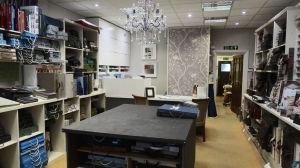 G&H Soft Furnishings Showroom | Interior Designers workroom Hertfordshire. We have many fabric sample books to choose from. Our knowledgeable staff will always guide you through and help you make the right decisions. Large samples can be ordered and are essential before a final decision is made – the lighting in your own home can make a huge difference to colour and tone and therefore it is sometimes important to view the fabric in situ, in natural and also artificial light. We also supply and sell Zoffany paints. We will be happy to help you through the minefield of choosing the right colour and also colour combinations and of course we have tester pots to purchase so that you can be sure the final finish will be perfect. The showroom has a huge range of designer wallpapers to choose from. Trimmings can really lift a plain fabric or enhance a patterned fabric; the showroom has an amazing range of beautiful trimmings to choose from.